Asst. Bishop Steven Charleston - "Revolutionary Christian"
Steven Charleston is Assistant Bishop of the Episcopalian Church of California. He is a champion of "social justice" and a leader of the Church's "liberal" wing. Steven Charleston is widely recognized as a leading proponent for justice issues and for spiritual renewal in the church in both the United States and Canada. He has been called "one of the best preachers in the Episcopal Church," leading worship services ranging from a revival style service in Texas to Lenten Services at Harvard University. A citizen of the Choctaw Nation of Oklahoma, Bishop Charleston was born and raised in that state in a family that has had a long history of service in the Christian Native American community. Both his grandfather and great-grandfather were ordained ministers of the Presbyterian Church, serving among the Choctaw People in rural Oklahoma. His vocation in the church has been extensive and varied. 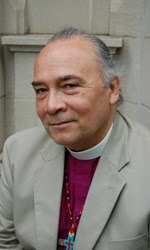 He was the national staff officer for Native American ministries in the Episcopal Church; the Director of the Dakota Leadership Program; professor at Luther-Northwestern Seminary in Saint Paul, Minnesota; the Bishop of Alaska; chaplain of Trinity College in Hartford; Assistant Bishop of Connecticut; and most recently, the President and Dean of the Episcopal Divinity School in Cambridge, Mass. Steven Charleston has been Chair of the House of Bishops’ Justice, Peace and Integrity for Creation Task Force. Bishop Charleston has appeared on ABC World News Tonight, BBC World News, BBC Today Programme, The News Hour with Jim Lehrer, The O'Reilly Factor, and Hannity & Colmes, and WRKO radio in Boston. But here is an interesting and little known fact about Asst. Bishop Charleston. 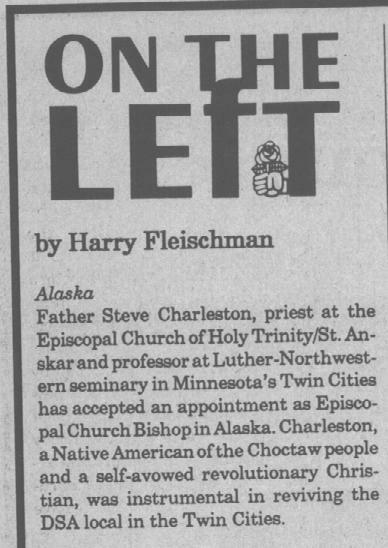 In 1991, Father Steve Charleston, priest at the Holy Trinity/St. Anskar and professor at Luther-Northwestern Seminary in Minnesota's Twin Cities, accepted an appointment as Episcopalian Bishop of Alaska. "A Native American of Choctaw descent, and a self avowed "revolutionary Christian", [Steve] Charleston was instrumental in reviving the Democratic Socialists of America , local in the Twin Cities." I wonder how many of Steven Charleston's parishioners, students, colleagues and media contacts, know of the Asst. Bishop's marxist background? Amazing, isn't it? Have you read the book "Communist Trail in America" by Jacob Spolansky? Copyright 1951 but written about the issues facing our nation beginning in the 1920's concerning Communism. However, you'd think it was written in 2040 written about the issues in 2010. 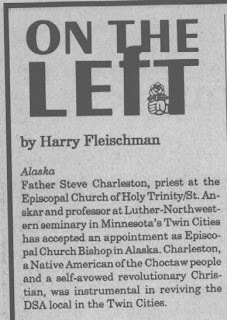 +Steven Charleston is the perfect Episcopal bishop – a Marxist and a Choctaw. Wow! ++Katharine Jefferts Schori and +John Shelby Spong must be dizzy with glee. How I wish we had a group like the C.I.A. There's a Foundation there somewhere - money siphoning/laundering is the name of the game. Hunter resigned from the Christian Coalition in 2006 because they refused to back down from their anti-abortion and anti-gay marriage stands. I think this is where they spotted him. He spoke at the DNC convention touting him as a prolife Republican. Hillary has been portrayed as entering college a Republican but I don't buy it. Her pastor Don was a flaming leftie from Chicago asi is Hillary herself, he groomed her from her teen years. Hillary needs to be relooked at - it's amazing what one will find under the stones. Bill Clinton was/is the man behind the woman. I forgot to mention that Annie Murrell started Carlton Pearson's "Sacred Activism Church". And that church only one of many. Churches are nonprofit just like the Foundations. RFK Jr. spoke at their 2007 conference. HA! I don't know how we can get the left to wake up. Beck is trying let's hope he succeeds. I was at the protest at ground zero today and tried to talk to a few pro-victory mosque people (1000 of us and 70'ish of them though the faux press will turn it around)anyway it was to no avail. They've been so indoctrinated into the multicultural PC lingo.